Successfully Added Intelligent 3D Printer Pen - Adjustable Temperature, OLED Display, Metal Design, 0.6mm Nozzle, ABS and PLA Filament (Black) to your Shopping Cart. With this intelligent 3D printing pen there will be no limits to what you can create. 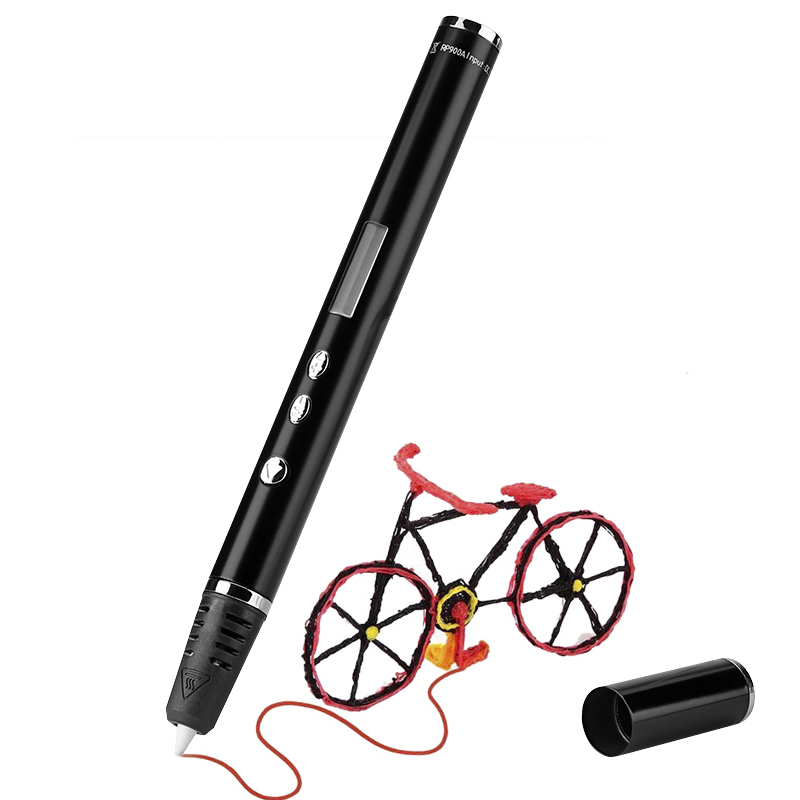 Allowing you to print 3D figures and drawings, this stereoscopic pen truly lets all your imaginations come to life. With its full metal body, this printer pen features a stylish design that lets you use it with confidence at any occasion. Being merely 14mm wide and ultra-light in weight, this 3D pen can be used conveniently by people of any age. Integrated within its sleek body lays a sophisticated OLED display that provides real-time data on your currently applied settings – ensuring that you’ll always have the right printing mode selected to create the art of your liking. This 3D printer pen comes with 3 colorful filament strips, letting you use it straight out of the box. Simply plug in your adapter or, additionally, use it with your power bank. This stereoscopic pen truly makes 3D printing portable and allows you to print, draw, and create all you have in mind no matter where you’re located. Thanks to its adjustable temperature control, you will be able to adjust the settings to your own liking and print both PLA and ABS filaments. This brings along a wide range of 3D printing possibilities and ensures that you’ll always be able to use the right material for your upcoming projects. Its automatic filament refill feature will further increase and simplify your user experience by allowing you to eject and change your filaments automatically with the press of a button. Its high-quality 0.6mm nozzle is extremely accurate, letting you create detailed art projects and assuring a stunning result. This ceramic nozzle furthermore brings along safe and secure usage as it offers great protection against the heat generated by your 3D pen during its printing processes – truly making it a safe-to-use electronic gadget that can be used by professionals and beginners alike. To protect this high-end nozzle, this stereoscopic pen comes with a protection cap – making sure it won’t get damaged while not in use or when carried around in your bag. Whether you’re a professional artist, hobbyist, high school student, or simply want to have some fun – this 3D pen is guaranteed to bring along great efficiency and hours worth of entertainment. Thanks to its high-quality design, it comes with an ultra-long service life. This allows you to print out imaginations and bring them to life for many years to come. This intelligent 3D printing pen comes with a 12 months warranty, brought to you by the leader in electronic devices as well as wholesale electronic gadgets..